It's Monday again and I'm kicking off the week by hosting one of the first stops on the Something Old, Something New blog tour! This book is perfect for the time of year. I always associate springtime with romance, and not forgetting the approaching wedding season, it couldn't have come at a better time. The book follows the story of Annie Thomas, a single mother with not one, but two ex-husbands under her belt. It takes a little while to really get going - Annie has a tendency to moan rather a lot about various people, work, and just life in general. This can get a bit repetitive at times, especially as we're just going over and over the same points time and again. However, once things get going, the story definitely improves and picks up the pace. Annie has one of those perfectly unconventional families that you only ever find in romcoms and chicklit. The combination of a single mother, two ex-husbands, a teenage daughter, her boyfriend, two little kids, two interestingly named dogs (which, by the way, surely have to win some kind of award for the best named dogs in fiction) and a bearded dragon are ideal for creating endless comedic situations for the characters. In fact, it's these incredibly realistic moments of comedy genius that really make this book. There are little pockets of humour throughout, but every now and then you come across something that genuinely makes you laugh out loud - the cricket incident is my personal favourite! Compared to the humour, I felt the romance part was slightly lacking. Don't get me wrong, it was pleasant enough, but Annie and Evan just didn't have that crucial spark, in my eyes. If anything, it felt rather rushed - it feels like we missed out on a lot of the development of their relationship this time around, and they were talking about feelings and emotions that we just weren't seeing. I actually think that it's a combination of the children and the humour that steal the show here. The two are so intrinsically linked that the humour definitely trumps the love aspect in my opinion. All three of Annie's children are so lifelike that their lives are a pleasure to read about. The author doesn't shy away from the messy side of parenting - the children are by no means perfect, but the story is so much better for that. From sweet Annabelle to conflicted Janis to Henry, who is wise beyond his years, the children are the real stars of this story. If you fancy getting your hands on a copy of the book you're in luck, as we're giving away 3 e-copies as part of the blog tour. Enter via the Rafflecopter widget below - good luck! 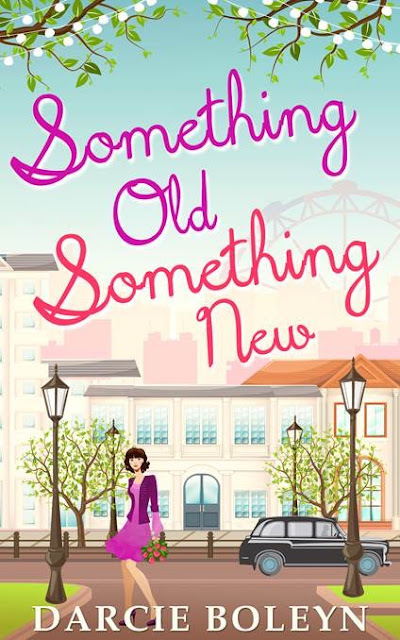 A heartwarming, laugh-out-loud tale of second chances, Something Old, Something New is available to buy now. 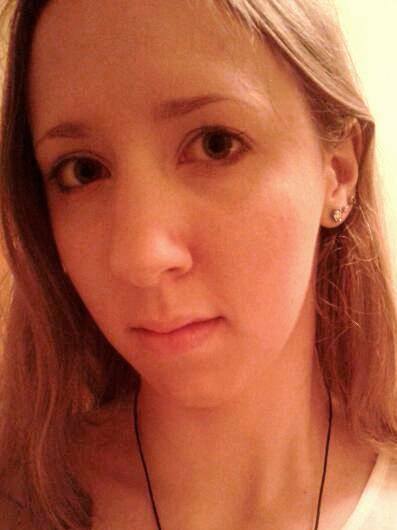 To find out more about Darcie Boleyn, visit her blog or find her on Twitter or Facebook. Don’t miss the second book in M.J. Lee’s brilliant Inspector Danilov series. First things first - I haven't read Death in Shanghai, the first book in the series. But does that matter? No. Although it is technically a sequel, City of Shadows can easily be read as a standalone. Admittedly you miss out on introductions to the main characters, but it's easy enough to pick things up as you go along. I love reading a good murder mystery or a crime thriller - both of which this book is, but the thing I found to be most unusual about City of Shadows was actually its setting. Personally, I haven't read a lot of books, much less crime books, that are set anywhere outside of the UK, US or Scandinavia. So with that in mind, it was a very refreshing change to read this. 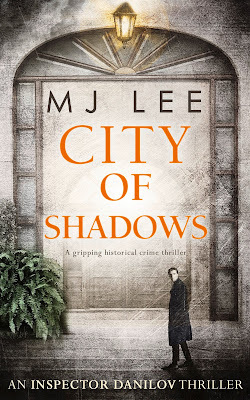 City of Shadows is set in Shanghai - and 1920s Shanghai no less - which adds another intriguing level of history to the novel, which I loved reading about. Perhaps sparked by the setting, location and time period, I found the racial tensions and struggle for equality fascinating. It by no means dominates the story, but it is still an integral part of the book, especially as certain events rely on these human struggles to make sense in the world of the novel. The sheer mix of people from all over the world, different backgrounds, classes, even dialects, all help to shape the version of Shanghai which is portrayed to the reader. We see Shanghai as a bustling, vibrant, yet sometimes dangerous city - a city vividly brought to life by its inhabitants. Inspector Danilov is a good character, if a little repetitive. I found the whole subplot about his family distracting and unnecessary, if I'm honest - perhaps because I haven't read book one, I just didn't feel invested in his personal story beyond his job and the case. However, the cast of supporting characters was just as vibrant as the city they inhabit. From Danilov's sidekick Strachan, to the Lee family, to a wide cast of various criminals, they each helped to weave the threads of the story together. The idea of having multiple narrators (switching between each other without introduction) could have been disastrously confusing, yet it worked well, mirroring hectic Shanghai life even in the actual writing itself. City of Shadows is a solid crime thriller, brought to life by its cleverly-used location. The book is available to buy now. Will you be reading City of Shadows? Let me know in the comments below! 'Pigs will fly before Busted reform'. That's what everyone (including the band themselves) was saying in the decade since pop trio Busted split up in 2005. Following reports of a 'rift' between Charlie Simpson and the other boys, Matt Willis and James Bourne, Charlie eventually left to pursue his musical ambitions fronting alt-rock band Fightstar. In the years that followed, all three trod different paths with their music. Following the success of pop supergroup McBusted, of which James and Matt were members, a surprise announcement in November of last year put a stop to the endlessly-circling rumours. Seemingly out of the blue, the band announced a UK-wide arena tour, causing Busted fans across the country to go into overdrive on social media. Six months down the line, and 11th May 2016 marked the first date of the aptly-named 'Pigs Can Fly' tour. 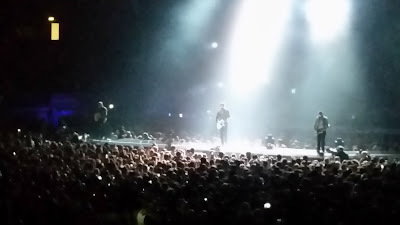 Kicking off the tour at Wembley's SSE Arena, this was the band's first live show in 12 years. All eyes were on Wembley, as fans and critics alike waited with bated breath to see if Busted still had it after spending so long apart. Support came in the form of Emma Blackery, who I have to admit I'd never heard of before, and I can't comment on her performance now either because I was stuck in a queue for merch when she came on; and Wheatus. Despite the fact that I always thought of Wheatus as a bit of a one-hit wonder (and to be fair they have every right to still be dining out on a single as popular as 'Teenage Dirtbag') they seemed to have attracted quite a loyal fanbase among the Wembley crowd. After possibly the shortest interval I think I've ever experienced between a support band and the main act, we were treated to a slightly bizarre introductory pre-filmed segment featuring various people wearing white pig masks (yes, that was as creepy as it sounds) before the curtains came down to reveal 'the pigsty'. The pigsty is the latest in a long line of premium ticket upgrades offered by various bands and artists, promising greater interactivity and once-in-a-lifetime experiences in exchange for eye-watering amounts of cash. Following in the footsteps of the likes of the OMFG zone, the pigsty allows a select group of fans willing to cough up the opportunity to watch the show from on stage, behind the band. And I have to say, if I had paid for a pigsty upgrade, I would have surely felt slightly ripped off - it seemed to be much more of a ticket gimmick rather than a truly special experience. Just as the fans were going into meltdown (the arrival of Mcfly's Harry Judd and Dougie Poynter a couple blocks along from me didn't help matters) the boys shot up onto the stage via trapdoors and launched straight into their first song, brand new single 'Coming Home'. We were off at last. 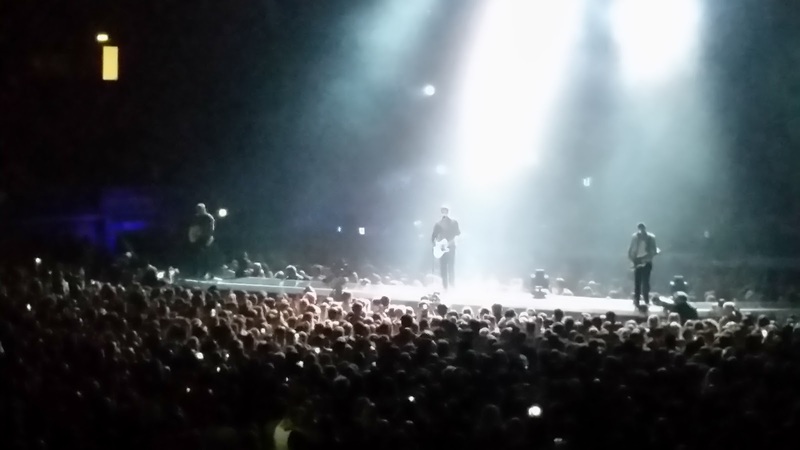 I was too young to see Busted live the first time around, but it felt like they'd never been apart. The entire set was full of energy, with the boys bouncing off each other and the crowd to produce an electric atmosphere. It was clear to see how much they were enjoying it and how much it meant to them to be back - Matt for one was jumping around the stage all night! With the exception of a few minor hiccups involving an inaudible guitar and Matt forgetting the lyrics to 'Crashed the Wedding' (luckily then being reminded by a fan in the OMFG zone) the whole evening ran like a dream. Partway through the show the boys migrated to the smaller B-stage in the middle of the arena. Now that the giant inflatable flying pig had been moved to the empty seating block in the corner in S15, strings of lights hung down from the rafters to just above the band's heads to create the effect of a giant rope-light chandelier. It was simple, yet surprisingly impressive visually - a concept that was applied for most of the show. The boys played all the fan favourites and their biggest hits from back in the day, interspersed with a sprinkling of brand new tracks from the upcoming album played to an audience for the first time. Although these new songs didn't get the crowd going quite as much as the old hits, I still thought they were excellent. It seems like the album will be a continuation of the more mature sound present on 'Coming Home', and these teaser tracks have definitely made me excited for the new release. Thank you Wembley!!! That was the best gig of my entire life! Love you guys! If you've got tickets to any of the remaining tour dates, you're definitely in for a treat! As it turns out, pigs really can fly. Are you a fan of Busted? Will you be seeing them live? Let me know in the comments below! A novel about love, loss, memory, and family relationships. 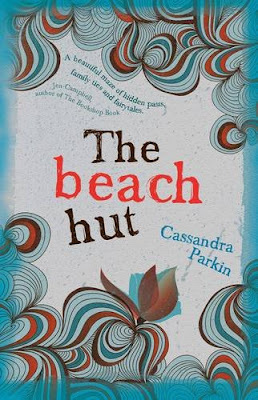 It is autumn time and on a peaceful Cornish beach, Finn and his sister Ava defy planning regulations and achieve a childhood dream when they build themselves an illegal beach hut. This tiny haven will be their home until Ava departs at midwinter for a round-the-world adventure. In the town, local publican Donald is determined to get rid of them. Still mourning the death of his wife, all he wants is a quiet place where he can forget the past and raise his daughter Alicia in safety. But Alicia is wrestling with demons of her own. As the sunshine fades and winter approaches, the beach hut stirs old memories for everyone. Their lives become entwined in surprising ways and the secrets of past and present are finally exposed. Despite the well-known saying, most of us are in fact guilty of judging books by their covers - I know I am! Finding a book with a visually-appealing cover makes me much more likely to pick the book up, especially when I'm just browsing in a bookshop. But why is this relevant to the review? Simple - just take a look at the cover above. Instant #CoverCrush! 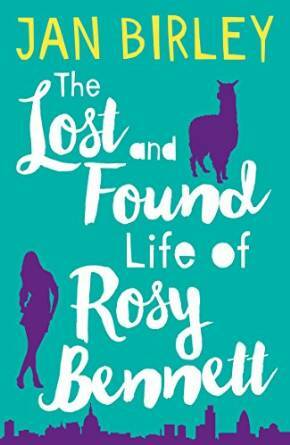 Without a doubt, Cassandra Parkin's covers are some of my favourites at the moment. As well as this fab design, take a look at the cover of her debut novel The Summer We All Ran Away. Stunning. Now we've all taken time to appreciate the pretty cover, it's time to move on to the review itself. As I was reading this book, I couldn't help but feel reminded of several others I've read and reviewed in the last year or so - Beneath the Surface by Heidi Perks, Rising Tide by Susan Roebuck, and The Curious Charms of Arthur Pepper by Phaedra Patrick. Each of these books places the same strong emphasis on family and the first two even have links to the sea as well! If you're a fan of this sort of fiction, I definitely recommend you check out these books. Anyway, first things first, I really enjoyed this book. It's that kind of fluid contemporary fiction that doesn't really slot neatly into a specific genre, and the story is all the better for that. The overarching themes in The Beach Hut are love, loss and family - at times it's touching and bittersweet, at other points it's funny as Finn and Ava fondly relive their childhood memories. In my opinion, one of the best things about this book is the way it triggers your own childhood memories as you read it. Finn and Ava's holiday memories could easily be interchanged with many of my own - memories of family holidays by the sea, with fish and chips and the unpredictable British weather. In that respect it's quintessentially British, and the author has done a brilliant job of capturing the very essence of those kinds of holidays. We are treated to several different narrators throughout the course of the book. In theory that sounds confusing, but it all makes sense as you read it. This technique works particularly well as it allows us to learn more about our four main characters - Finn, Ava, Donald and Alicia. We see things from their differing perspectives, and that really gives us a feel for the type of people they each are. Another point worth mentioning is that loss is dealt with in a very interesting way here. Both pairs of characters have lost people very close to them, but instead of focusing on the loss itself, we read about how the losses have shaped the characters and made them into who they are at the point we join their story. The loss is a turning point in their lives, but ultimately the draw of the sea and the need to fulfill that childhood dream of living in the beach hut is where the real story lies. The Beach Hut by Cassandra Parkin is available to buy now. Are you a fan of Cassandra Parkin? Have you read The Beach Hut yet? Let me know in the comments below! What if he couldn’t control it? What if he didn’t want to? Alfie Diamond, flat on his back, chilled to the bone in the freezing, unforgiving snow. Shocked, dumbfounded but even so secretly excited, still tingling from the thrill, if that was the correct word to use, from his near death experience but then again maybe it was just the mind altering effects of hypothermia, who knew? The images that had flashed before him during his “first” mind-blowing Awakening were alien to him, jumbled, super-fast messed-up glimpses of things to come and things of the past, but whose past, certainly not his, he would remember, surely, wouldn’t he? The faces didn’t register, the language fell on deaf ears and yet he inexplicably felt connected, suddenly his life gained a sense of direction, no more bobbing about like a cork in the open ocean. Purpose and motivation were coming his way, that much he had acutely been made aware of as the nerve endings of his brain cells fizzed with adrenaline-infused blood. He was on a precipice, he could lay there and continue to stare up at the descending snowflakes, let the raw, biting cold take him or he could grab this adventure with both hands steamrolling into a new unknown future, a future born of a secret so far back, so distant into the past it would surely send him to hell and back. Evil would seek to destroy him, Good would look to him as a saviour, him a naive, curly-haired East End boy, youngest of six children, average school grades, slight misfit on the outer edges of the obligatory social groups, not fit enough to be considered a 'Jock', not clever enough for the nerds and certainly not fashionable in his tatty t-shirt, shorts and scruffy trainers to be one of the 'beautiful people', a square peg in a round hole, well this square peg had been enlightened, today Alfie Diamond was reborn and if he ever got up onto his feet again, his first steps would be into a dangerous new world, a world he hoped included the beautiful stranger whose silken long hair trailed across his face as she hovered over him as he slipped in and out of consciousness, a world he hoped would not chew him up and spit him out. Diamond Boy in the Rough is Helen Faul's debut novel. Marketed as YA fantasy, it's actually one of those rare young adult books that manages to successfully cross over and work equally well as an adult book too. There's none of that patronising tone often sadly reserved for children's and YA fiction here. Our main character, Alfie, is instead treated as an equal and much-valued person by the rest of the cast. Alfie Diamond is a pretty typical pre-teen boy. His attitudes, views, and general outlook on life are very lifelike, as is his preoccupation with swear words and toilet humour! Alfie was brought up in London's East End, which is clearly evident by his mannerisms and accent (which, by the way, is very cleverly done - writing accents convincingly without going overboard can be very tricky for a writer!) However, I found some of the phrases Alfie used at times to be a little jarring. Would a modern-day young boy like Alfie really use phrases like, "Cor blimey?" I found the plot to be incredibly fast-paced - perfect to keep younger readers engaged, but maybe a little too fast-going for my taste. Personally I would have preferred to see more description and development between the major plot points. I felt that a lot of pretty big things kept happening completely out of the blue, which can disrupt the overall flow of the novel. And speaking of the overall flow of the novel... I'm sure regular TWG readers will know by now just how much mistakes, typos and general clutter irritate me when reading. Sadly, there were quite a lot in Diamond Boy. Now this is just me being picky as I'm sure most people would just gloss over the issues, but I can't help wanting to get my editing pen out for this book all the same. The joys of being an editor, right? Editing issues aside, Diamond Boy is a great tale of fairies, family, and hidden past, with a realistic, engaging main character. 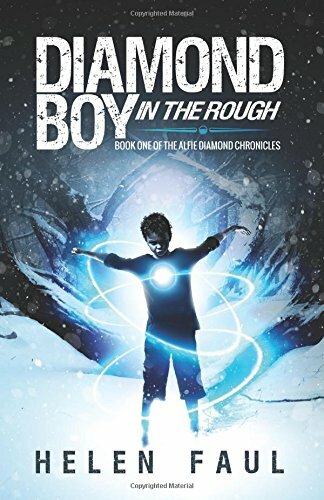 A promising debut, Diamond Boy in the Rough is available to buy now. Will you be reading Diamond Boy in the Rough? Let me know in the comments below!